To aid in recycling, we offer all-plastic pail, handle and flexible pull spout. and offers a smooth pour. · All plastic and rust-free. · Environmentally friendly, fully recyclable. · Collapsible for easy stacking. · Large bail for easy pull-up. · Push pull-up-spout down for storage. 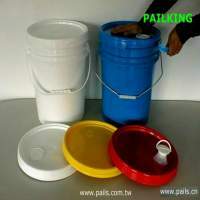 All PAILKING® plastic pails/containers are made of strong and durable Polypropylene (PP) or High Density Polyethylene (HDPE) resin. * Injection molded in one piece with reinforced ribs for extra strength. More cost-effective than metal pails.